Organic solar cells, as you'll recall, are a pretty active area of research now. They have a low efficiency as compared with traditional silicon cells, but are ideal for certain niche applications because their active layers are cheap, easily produced and flexible. The standard transparent electrode material for organic cells is indium tin oxide (ITO). ITO has a really low sheet resistivity, which is a good thing, but it is also brittle and becoming increasingly scarce. So using it actually negates some of the advantages of organic cells. Let's talk about another transparent conductor: graphene. Graphene is flexible and made of carbon, which is pretty abundant and inexpensive. It is of course also thinner than ITO. But, as I think I've mentioned before, graphene grown over large areas, as is required in the production of solar cells, tends to be of pretty poor electronic quality and actually exhibits a larger sheet resistivity than ITO. 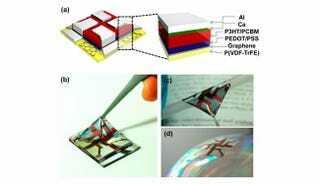 Now scientists are reporting a new method to improve the electronic quality of large-area graphene using a ferroelectric polymer coating, bringing ultra-thin flexible solar cells a step closer to reality. The ferroelectric polymer serves double duty in the device. First, it dopes the graphene by adding charge carriers, thus lowering the sheet resistance. Second, it also acts as a substrate for the device, allowing the whole thing to be only about 5 microns thick. That's 20 times thinner than a human hair! Actually, it does a third thing too — it serves to isolate the graphene from the surrounding environment, meaning these cells also last longer than others with graphene electrodes. Unfortunately, these cells are still demonstrating lower efficiency than ITO-based options, but they are doing well compared with other graphene-based cells. And what is science if not frustratingly tiny incremental steps towards an increasingly distant goal? Read the original study, Ultrathin Organic Solar Cells with Graphene Doped by Ferroelectric Polarization, in the journal ACS Applied Materials and Interfaces. Top image reprinted with permission from ACS Appl. Mater. Interfaces, 2014, 6 (5), pp 3299–3304. Copyright 2014 American Chemical Society.